These inspirational decks are expected to be ready by early November! and suggestions on how to work with the cards, and integrate the guidance they bring. please feel free to make a donation (of any size). The Wisdom Keepers and I will be deeply grateful! This order combines a First Color Edition Wisdom Keepers Oracle Deck (including the mini-Inner Guidebook) ​AND a fuchsia organza bag AND a set of 3 full-color Wisdom Keeper Postcards! ​If you order two decks, you'll receive 2 sets of postcards! 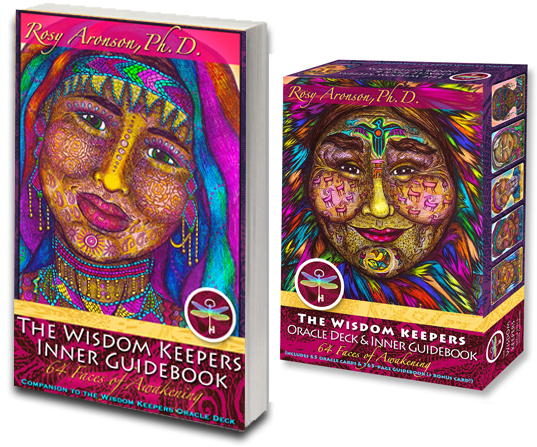 ​This order combines a First Color Edition Wisdom Keepers Oracle Deck (including the mini-Inner Guidebook) AND the 300-page easy-to-read Inner Guidebook -- signed by Rosy! 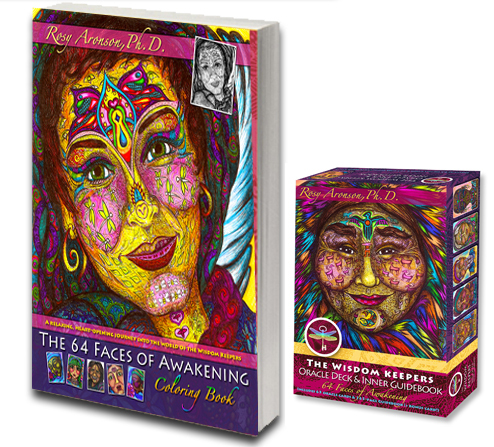 You'll also receive a fuchsia organza bag and a set of 3 full-color Wisdom Keeper Postcards! your donations (no matter how small) will be DEEPLY appreciated. International orders may be subject to import duties and taxes, levied once a shipment reaches your country. ​and we cannot predict what they may be. Contact your local customs office for further information. ​We gladly accept returns for any defective items or incorrect items on an order. Just return the item within 15 days in good condition for a refund or exchange. Please note the reason for the return and include your name and phone number. Refunds for orders not received must be reported within thirty days of the order date. Copyright © 2015, Roselyn Ann Aronson. All rights reserved. If you'd like to use one of my images, please contact me for permission.